BlogHome » Blog » Google Ads » Google Ads Attribution Models: Which One Is Right For You? Using Google Ads? If you do, how accustomed are you with your attribution models? Do you know how these work and how they help you boost the efficiency of your PPC campaign? An attribution model is a set of rules which determine where the credit goes for a conversion. Depending on the model, the credit goes to a different touch point in a conversion path. What does this mean for you? As a marketer, you would have to analyze the conversion path. This allows you to see which keywords or touch points are giving you the most conversions. Thus, it’s important you learn all the Google Ads attribution models. Read on to see all 6 of the attribution models, and find out which one best fits your strategy. Since May 2016, users were able to use different attribution models. The change allowed them to credit different touch points in conversion paths. Before then, Last Click attribution was the only choice. This wasn’t always the most suitable tool as it doesn’t show the full story prior to converting. After all, users take different paths before getting to a conversion. Using the right attribution model gives a clearer picture of these paths. Using the wrong one might make you miss some opportunities. Having a clear understanding of the paths users take can help you improve your strategy and reduce wasted spend. What are the Google Ads attribution models? There are 5 models available to all accounts and 1 model for advertisers with enough data. Learn more about each one and how it will benefit you below. 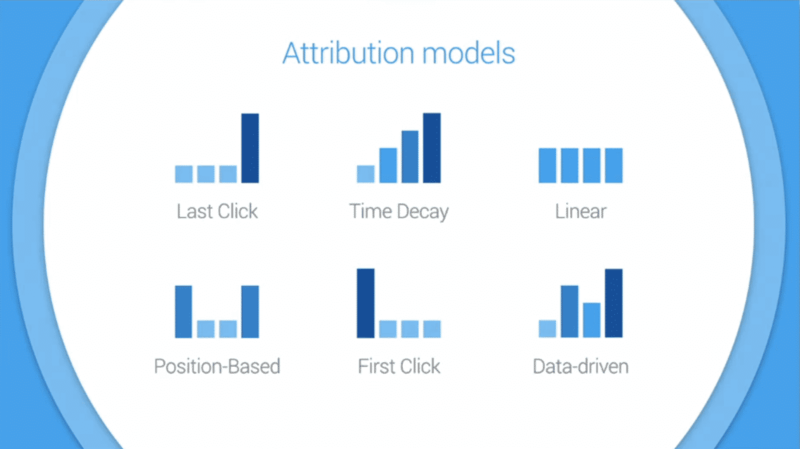 The Last Click model launched with the attribution modeling tool in AdWords in 2014. Today, it’s the default option, which assigns 100% credit to the last click in the conversion path. It allows you to see the last touch point before conversion, but is it right for you? This model maximizes efficiency, but it’s rather extreme in its efforts. Crediting only the last touch point might mean you’re not crediting the keyword. Even if a user searched the keyword, clicked your ad, then made a direct route to your website and converted, 0% of the credit will go to your keyword in AdWords. When you look at AdWords, you’ll be able to see that the keyword has a click yet no conversion. Instead, you would think that the Direct channel was the touch point that drove the sale. You would also assume that the keyword is only driving up the cost per action (CPA). Both assumptions are incorrect, which is why Last Click is not that reliable. It puts more value into customer recycling, remarketing, and brand terms. You won’t be able to get the true value of your campaigns. Like the previous model, First Click is pretty straightforward. It gives 100% credit to the first touch point. Let’s say a user finds one of your Google Ads and clicks on it. Then, the user comes back a few hours later through social media. The next day, the user enters your web address in the URL bar to buy. In the Last Click attribution model, the credit will go to the Direct channel. In the First Click model, however, 100% of the credit will go to the Paid Search channel. This model favors customer acquisition. If your goal is growth, this might be the right attribution model for you. Yet, like the one above, it doesn’t give you the whole picture. The problem with this is it attributes the Google Ad with the full credit for the sale. While it has a huge role in leading the user to convert, it’s not the sole contributor. It wasn’t the only touch point which led the user to a conversion. It doesn’t give importance to the Social Network and Direct touch points. It gives you inaccurate data, which then leads you to incorrect assumptions. It also favors competitive keywords, making it a rather inefficient model. This attribution model gives more credit on the last touch point. Still, it also gives credit to the earlier points. Google calls it Time Decay because the credit diminishes as it goes to the first touch point. For example, the user searches the keyword “Mango women dresses” and then finds your ad. The user clicks on the ad, then comes back a few days later to visit your website. The user sees your ad again in a social media platform and clicks on it. After a couple of days, the user visits the website again via your email campaign and then completes a sale. The path would look like this: user clicks on an ad (Paid Search) > visits the website (Direct) > clicks an ad in social media (Social Network) > converts via an email campaign (Email). Using the Time Decay model, most of the credit will go to the Email channel. Social Network will receive less credit, while Direct will receive even less. The Paid Search touch point will receive the least credit. This model is efficient while also giving credit to early touch points. Nonetheless, it undervalues the first touch point, which hooked in the customer. A Linear attribution model gives equal credit to each touch point. If a path has 5 touch points before conversion, then each one gets 20% of the credit for the sale. If the first two models ignore all the other touch points apart from the first and the last, this considers each one. This is an advantage since it allows you to see all the keywords which contributed to the conversion. If the user used 4 keywords before buying, you’ll see in your AdWords account that each one has 0.25 conversion. This can become pretty useful in bid management. But do all those touch points in a path deserve equal credit? The answer is no, and this is why the Linear attribution model may not be fit for you. It might be undervaluing major touch points that may have a larger contribution to the sale. Likewise, it might also be overvaluing minor ones. This might lead you to form incorrect assumptions. It also makes it more difficult to decide which keyword is performing better than the others. How do you decide where to put your budget if every keyword seems to have equal performance? Unlike the first two, this attribution model distributes credit to all touch points. It credits the first and last touch points more, though, giving each one 40% of the credit. The remaining 20% goes to the middle touch points. Take this path as an example: user clicks on an ad > comes back through social media > finds your website through organic search > comes back and converts via a direct visit. Using the Position-Based model then, 40% of the credit goes to Paid Search touch point. Another 40% goes to Direct, 10% goes to the Social Network channel, and 10% goes to Organic Search. This allows you to focus on the key touch points while giving credit to all the other touch points. It also enables you to value growth and customer acquisition. All the while, it gives you a clearer picture of the path taken prior to conversion. Is it perfect, though? Not at all times. It might be undervaluing some touch points in the middle, especially if the purchase cycle is a long one. Furthermore, it assumes both the first and last touch points have the same weight. One of the two might be more pivotal to the conversion than the other. Yet, the model shows you they share equal responsibility. Still, this one might be the best option for beginners. With some tweaks from time to time, many long-time advertisers find this the most useful as well. This is the 6th attribution model which is only available to some advertisers. When you go to Google Ads, sign in, and see this option, it means you have enough data in your account. The Data-Driven model gives credit based on data, meaning it calculates the actual contribution of each touch point to the conversion. This sounds good on paper, but it’s only a single-channel view. It only looks at your AdWords data, ignoring other channels like Email or Social Network. Furthermore, it has a pretty hefty set of requirements. Your account must first have at least 15,000 clicks and at least 600 conversion actions within 30 days. You must then maintain 10,000 clicks and 400 conversion actions each month to continue to access this model. While this is a great attribution model for Google AdWords, it may not even be available for you in the first place. If it is, then you may use this tool to your advantage. Final Verdict: Which One is Right for You? As with everything, which one of the Google Ads attribution models is the right one for you depends on your needs. Review the strengths and weaknesses of each one, and then look at your goals to see which one fits them best. However, if Data-driven is an option for you we typically recommend it.